One of Zagreb’s signatures is definitely the Zagreb Funicular. It’s the shortest funicular in the world and the oldest public transportation system in the city. But hey, can you guess the length of its track? If you said 66 meters, you’re right, it most definitely is! Do you know how long it takes for it to reach its destination? 64 seconds! If you guessed both, you’re just awesome. The funicular connects the Lower Town’s Tomićeva Street with Upper Town’s Lotršćak Tower and St. Mark’s Square. It was originally designed in the 19th century by D.W.Klein, an entrepreneur from Osijek. Klein got his Eureka moment when he saw that the wooden stairs leading from Tomićeva were the busiest route which connected the Lower and Upper Town, so he thought, why not make a profit? He drew up the blueprints modeled after the cable cars in Budapest and Zürich. The City Council approved his design and the construction began in January 1889. However, it famously (or infamously) broke down during its test ride, which ended in a total disaster. The whole machine collapsed because of some faulty bearings. It was finally put into regular use in 1890, powered by a steam engine. Initially, it was divided into three classes: the first two were for the wealthier passengers who wished a better view of the city (for a whole minute). It never ran smoothly, so locals made jokes about it: the Croatian word for it is „uspinjača“, the Croats called it „zapinjača“, which roughly translates as „a thing which gets stuck often“. It’s funnier in Croatian… However, no people were ever injured while riding the funicular. The City of Zagreb was given the rights to it in 1929 and it was renovated over time. The funicular got a brand new electric engine in 1934, and by the end of the ‘60s it was the oldest funicular in the world, but it couldn’t run any longer without heavy maintenance, so renovation of the machine began in 1973. The funicular was then re-introduced a year later. If you’re really really interested, you can examine the original parts in the Technical Museum in Zagreb, located on Savska Street. 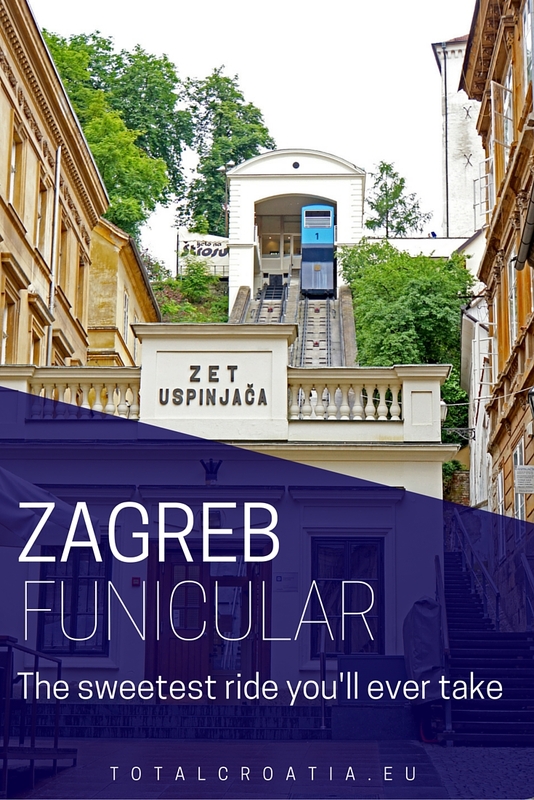 The Funicular kept its original appearance until today and stands as a cultural monument, which is one of the reasons the website European Best Destinations named it the second best funicular in Europe! If you find yourself in Zagreb, make sure you take a ride in it. It runs for seven days a week from 6am until 9m and departs every ten minutes. The price of a one-way ticket is 4 Croatian kunas or about 50 Euro cents. Oh yeah, do not fear, it doesn’t get stuck anymore!